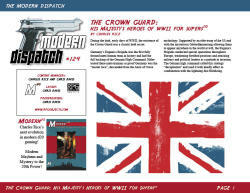 The Crown Guard: His Majesty's Heroes of WWII for Supers20. Britain's answer to the Eugenics Brigade! On the eve of the Battle of Britain, it was time for Churchill to pay the price for his defiance of Hitler. For the glory of the Thousand Year Reich, Hitler had decreed that his enemy, the British "warmonger" must die at the hands of his "children of the Aesir". Once this was done, and fire rained from the skies courtesy of the German Luftwaffe, Hitler would order Britain to surrender or the brigade would assassinate His Majesty. But unlike Czechozlovakia, Poland and even France, the Eugenics Brigade failed. A small group of British heroes had stopped the unstoppable. And as Hitler's sky fire was met with equal fury by the Royal Air Force, more heroes flocked to the side of freedom's last defense, from Canada, from France and from Poland. The tide had turned. Their finest hour arrived. Big Ben, Excalibur, Esprit, Grizzly, Illustrious, Ironclad, Repulse, Swordfish and Zbrojmistrz. They are His Majesty's Defenders. They are the Crown Guard.